What did you think of The Awakening? If you’re interested in seeing The Awakening, you’ll likely read how it takes bits and pieces from The Others, The Sixth Sense, and countless other suspenseful types of movies over the last few decades. You’ll also likely read that it isn’t very original, and that people may have not liked it. I’m here to tell you that those people couldn’t be more wrong. Sure, it pulls from other movies from the genre. How can you not? More or less everything’s been done over the last few decades, it’s tough to come up with any new ideas that don’t have a hint of another film in them. That’s near impossible. 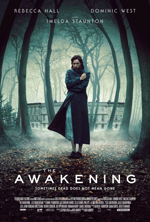 The Awakening, I’d go as far as saying, is fantastic. I loved it. Perhaps it’s because I’ve loved Rebecca Hall since The Prestige. Perhaps it’s because I was dying to figure out what was actually going on the entire time. I kept thinking I had it all figured out, and then it turned out I was wrong. I think the reason some people didn’t like this movie is because they expected to be scared out of their minds the entire time. And that’s not what The Awakening is meant to do. Sure, it’s a “ghost story” in the traditional sense, and that’s how it’s been billed in the (limited) trailers I’ve seen for it. But that’s not what it is at its core. It’s got a few jump out of your seats spots, but nothing to make you want to cry. It’s not that scary, and I’m okay with that. What is it then? It’s a story that happens to take place at a boarding school for boys, that happens to be haunted. The story that we see, and the point of the movie is to tell why the boarding school is haunted. And I loved the way they tell this story. It gripped me in a way that one of these types of movies hasn’t in quite a while. I think back to the last of these types of films that I saw in the theater, which was the absolutely dreadful The Woman in Black, starring Daniel Radcliff. Which was abysmal, at best. The Awakening doesn’t scare your pants off, but it does get the job done. If you like movies that make you think, let you try to figure out what the “answer” is, and have people with British accents, this film’s for you!